To identify “buying opportunities” in “extreme” situations, we identify historical extreme situations and use them for a benchmark. Provided that a correction occurs in an active bull market, the insights from this kind of analysis can be very helpful. Most should agree that the credit crisis was a major economic event that pushed nearly all assets down to an extreme low. We have used this kind of extraordinary market action as a comparison for the current commodities correction. In the above chart we simply measured the percentage drop of the current correction and compared it to the extreme drop back in 2008. Based on this chart it is safe to say that the current correction could be considered extreme. 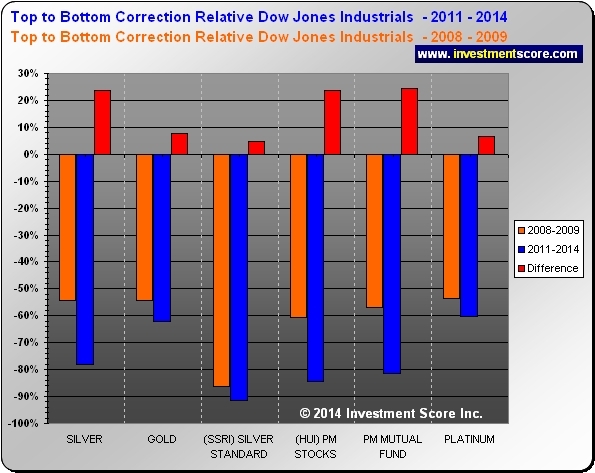 The above chart illustrates the two extreme corrections relative to the Down Jones Industrial Average. 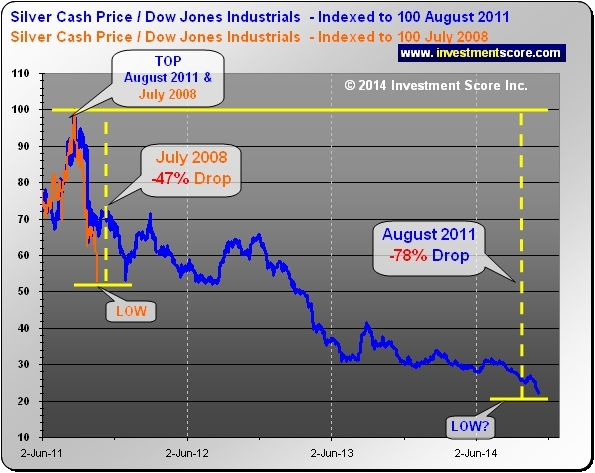 The above lines are a ratio of the silver price divided by the Dow Jones, and we can see that the drop since August 2011 has been much larger than 2008. Using the drop following July 2008 as a benchmark, it appears that selling stocks and buying silver at this time may be a great opportunity. In the above chart we can see many examples of the extreme correction since 2011. The current drop from top to bottom (2011-2014) even exceeds the Credit Crunch of 2008 & 2009. 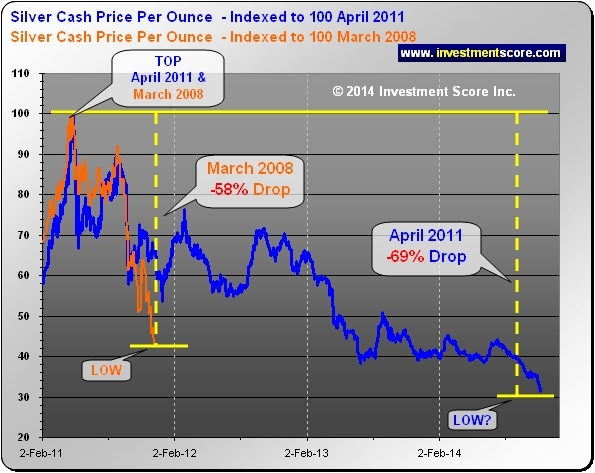 When silver hit a low of $8.88 in 2008, it then climbed over the next couple of years to an impressive price of $48.70. Using the past as a guide, it may make sense to sell some Dow Jones Industrial Average (Stocks) and buy some precious metals related investments.